Did I hear someone say the White House Easter Egg Roll is too superficial an event to pay much attention to? Getty and AFP didn’t seem to think so. I counted at least four of their finest photographers covering it. The fact is, photographers haven’t had this kind of prolonged access to Trump since the inauguration. So, the event might seem trivial, but it provided the rarest opportunity to see Donald Trump, ostensibly the father-in-chief, with his family in an unusually public and personal situation. Wishing for a more humble, generous and self-effacing version of Trump, I was disappointed from the start watching his descent onto the South Lawn. 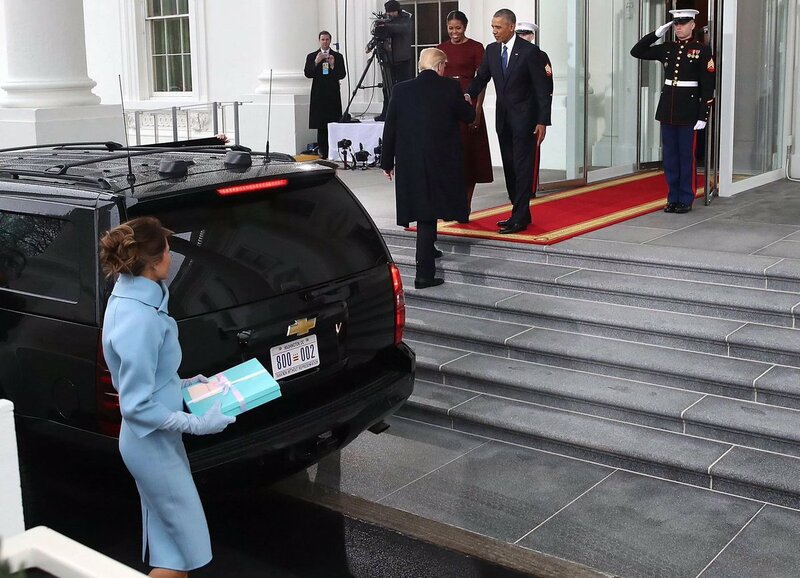 Just like that famous inauguration photo of him getting ahead of Melania in the White House driveway, we see how Trump, as always, comes first. After the belly laugh, I was feeling out how this would read if it was Obama or Bush instead. It’s a question that brings a gut level feel for a person to the foreground. For me, at least, the exercise makes the photo more tense than fun. Ultimately, Getty’s Win McNamee shot brings those ears into perfect alignment with Trump’s hyper-concern with his self-image, his tendency to bristle with even the hint of perceived slight, and perhaps the biggest emotional red flag when it comes to Trump, his lack of a sense of humor. One other tell, by the way. Why not accede to the day and, at least, don a pastel tie? He could have coordinated with Melania (more on that below) and lend himself more sympathetically to the occasion? I can’t remember seeing Trump, outside of a specific photo op, or a televised and a clearly performative moment, interact with children. At this table, the Donald joined a group of youngs coloring messages to the troops. Most of us understand that kids, as part of the development process, are inherently self-centered. In a situation like this, the typical instinct is for adults to subsume their own egos. Specifically, we encourage the children to express themselves, then proudly share their handiwork to the grownups. Instead, it’s: look what I made! On the subject of “all things Trump,” the Wall Street Journal ran a version of this photo on Instagram to represent the White House Easter Egg Roll. What it didn’t indicate was that it only showed the Trump clan. With the chance, and the rare opportunity to embrace the public, was it weird for the Trump family to get their own egg roll round? With the nepotism in the West Wing, the ongoing conflict of interest with Trump’s and Kushner’s businesses, and the family as brand, however, perhaps we’re just used to it. Of course, with the White House scrambling to pull off the vent, the other thing the photographs demonstrate is: #EasterEggRollSoWhite. Although Jared and Ivanka were absent (maybe for religious reasons, but perhaps to actually lower their exposure for a news cycle), the event was also spiced with some cameo appearances. I’m sure the photo editors jumped on this one. With the Press Secretary having become a parody of himself, Spicer’s posture is indistinguishable from a press conference. Is it ironic, also, that the book is a “how to”? And then, we see the draconian Jeff Sessions reading: It’s not easy being a bunny.” With anyone — besides American-born, white, upper-class humans — under duress from this Justice Department, photos of Sessions are always about smoothing the rough edges. But the images that struck me most from the event were these of Melania. Recently, I made an argument in an article for CJR about the political relevance of the Trump marriage. Like the first photo in the post, it’s painful to see how these two people operate together, or don’t, especially away from the network video cameras. Sure, I might be reading in, but this photo seems particularly lonely and wistful to me, especially in the lingering resonance of the Obamas always together. Especially at the Easter egg roll. But this, so impressive for newswire photography, was the most personal and intimate image of the day. The picture, by AFP’s Brendan Smialowski, simply consists of that lovely pink material, a rock and clenched hand. Clearly, Melania is not having an easy time of it.